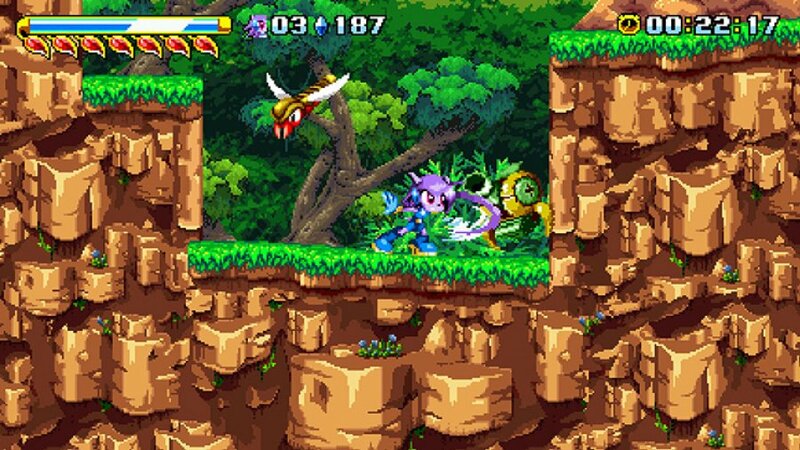 Yes, Freedom Planet feels like an old-school 2D Sonic game, but thankfully it manages to overcome some of the hurdles that bog down the blue hedgehog's classic Sega games. 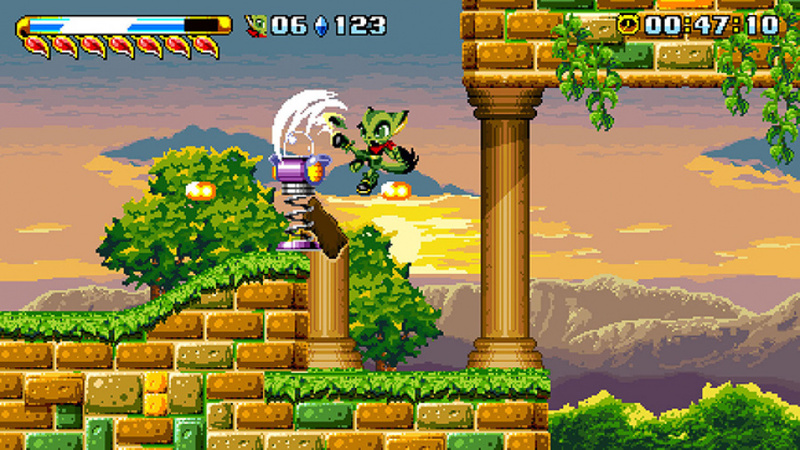 Freedom Planet boasts colourful characters whose story extends past a bland cliché of catch phrases. The art style consists of a gorgeous colour palette that results in pixel art that jumps off the screen. Fast-paced action is balanced with platforming segments, and the music serves as a perfect complement to the frantic setting. 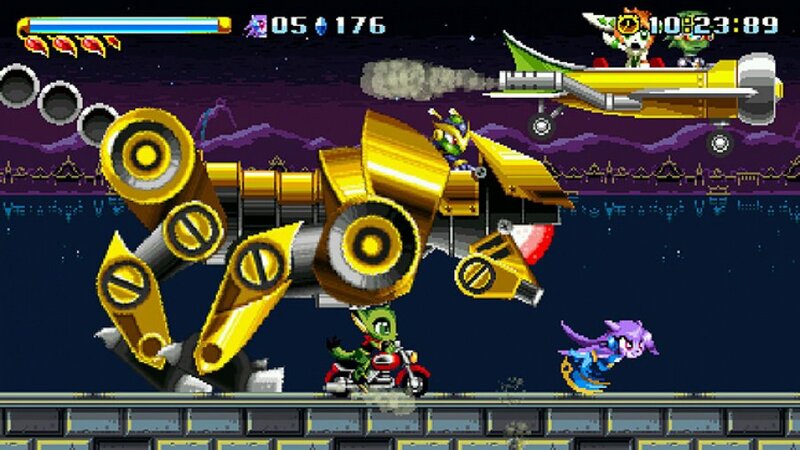 More than the sum of its parts, Freedom Planet is just plain fun. There aren't many game modes available, but what's there is solid. You can select Adventure (stages with cutscenes), Classic (just stages, no cutscenes), or time trials. You are eventually allowed to pick from three characters – Lilac the Dragon Girl, Carol the Wild Cat, and Milla the Basset Hound – and this adds considerable replayability to the experience. Each character has a fairly limited move set but they are ultimately satisfying and unique, and you have to think differently depending on which one you choose. Two additional characters (Spade and Torque) are set to be released later this year as free downloadable content. Lilac is your default character (the "Sonic" character of the game), a charming dragon girl that exclaims a pleasantly enthusiastic "Cyclone!" during her gliding spin attack in the air. You can perform a multi-directional dash attack which is limited by an action gauge; the cyclone attack also takes a small part of the gauge as well. She also has a short range attack, and can execute an uppercut from the ground or a downward kick from the air. The other characters have very different toolkits; Milla, for example, substitutes the formation of a block that she can throw at enemies in place of a spin attack. Regardless of who you're playing with the movesets feel solid, though on occasion it seems like certain situations were built with specific characters in mind. This isn't an issue when playing the extra stage exclusive to whichever character you select, but it can be frustrating when playing through the rest of the main stages. The art direction oozes charm from the second you start the game. A surprisingly serious opening cinematic quickly transitions into gameplay, and bright vibrant colours soon dominate the screen. Occasionally Carol blends into the background, but that doesn't break the aura. The GamePad allows for off-TV play, and the visuals looks stunning even on the portable screen. Not to be outdone, the music flows with the action; it has just the right amount of pace, blending impressive drive with light-hearted nuances and melody. It's energetic and upbeat enough to keep the blood flowing, but not so much as to wear you out; the invincibility tune is particularly noteworthy. Stages stay novel through the use of different environmental puzzles and patterns, and the recurring need to switch between fast and methodical gameplay helps to mix things up as well. The mechanics remain solid throughout the game, though there are some frustrating moments when using characters other than Lilac – the game feels like it was built for the dragon girl. Environmental tools like a swinging trapeze that propels you forward do a great job of keeping everything feeling fresh. Enemy design is consistently interesting and varied. You remain on your toes throughout the entire campaign, and the game never overuses any one enemy type. Many enemies are charming in their presentation and reminiscent of days past; several enemies and obstacles directly reminded us of past Mega Man games, in a good way; there's even a section with spikes that drop from the ceiling a la Mega Man 2 for the NES. Boss battles are engaging and exciting, simple yet enjoyable – for the most part. There were a few occasions that didn't feel fair, as you need exhaustive repetition to figure out what you were supposed to do. However, the game is great with checkpoints and never penalizes you too severely when you die, and the reward of a massive explosion that occurs when you finish the stage's final boss makes your victory especially satisfying. You probably won't pick up the game for the story or voice acting, but because there's a large amount of both for a game this size they warrant discussion. Freedom Planet tries to flesh out its characters through dialogue and story, but for the most part this area falls short. What's there feels disjointed and at times random; perhaps the developers were trying to be humorous with that approach, but it just doesn't work most of the time. It jumps from serious to random and playful, then back to serious, without the ebb and flow that's necessary for a cohesive narrative. The story also falls into the trap of introducing too many characters in too short of a time span, and it's hard to care about almost any of them because there's very little development. While Lilac's performance consistently hits the mark, the voice acting for the rest of the game varies widely in quality. Some characters don't have much passion behind their dialogue, and that omission is further highlighted through the contrasting strong performances of others. Sometimes the script doesn't mesh with the voices being used, and that results in conversations feeling disjointed. Volume is a little inconsistent at points, as one character speaks louder than the others, but never to the point of ruining the experience. On the other hand, at times the vocal exchanges feel raw and natural, something that is rarely achieved in this genre. There's a fairly significant amount of cutscenes and voice work, and the efforts are for the most part commendable, even if they fall flat at times. Small issues aside, Freedom Planet is a fun and worthwhile experience. Replay value is high due to the hectic nature of the stages (you won't see everything during your first playthrough because you'll be moving too fast) and the diverse experience of playing with different protagonists. Add in the fact that there'll be two new characters as free DLC, and there's plenty to keep you coming back for more. If you enjoy platformers but never got into Sonic games, give this one a shot – you might find yourself pleasantly surprised. Played the demo... controls are weird at first... might get on sale. Cool game, at least it's much more fun than the two recent Sonic games. Oh cool, I didn't think this game would get DLC and for free. A great game and a great homage to Sega 16 bit platforming, something I've wanted for awhile now. Great job GT! A basset hound? That's really funny to me for some reason. I really liked the demo, so this is a must buy for me. Glad it's been well received. Any news on a UK release date? Orange is the new pink. You are seriously disturbed. I didn't choose the Sonic life. The Sonic life chose me. I liked the demo and might get this this when (if?) this comes to europe. @dizzy_boy Most likely not until November. Ok the review is weird. First you say that the moveset for each character is pretty solid and then you say that Lilac is the one that plays best? Anyways, while I didn't get the Wii U version but the PC instead, I can say that its worth any Sonic game that SEGA has to offer us. I feel the collectibles are underwhelming because the rewards you get for getting them are so limited but still its a fun enough game at the very least. @holygeez03 don't you get a discount when you have the demo? "[T]he hurdles that bog down the blue hedgehog's classic Sega games." Uh, what would those be, exactly? I played the demo and wasn't amused. Might get it on a far lower-pricing sale, though. I'll stick to Runbow, Super Mario Maker, and Plague of Shadows in the meantime. Let Sonic and its clones just die already. Seems really fun. I have given up on Sonic titles since the only non-2D games I enjoyed were the Adventure titles (although I heard Colors and Generations were pretty good), so I might give this a go next time I need small game to spend my time on. Glad to see that it turned out well. @Dr_Corndog I don't know. The review goes on to list four different things in that paragraph, and while the first and third are definitely issues in many modern Sonic games, none of those four things are problems in the classic Sonic games on the Genesis. This is a 9 or 10 to me. Really awesome game. As a previous Genesis owner, I too never liked the sonic games. that so called 'speed' felt like a one trick pony gimmick....It didn't work well at all, so what if sonic is blazing full speed through loops and springing off springs, when it's barely controllable or fun to pull off. it's almost like the equivalent of watching somebody on a roller coaster ride. You're blazing through a stage at full speed only to come to a comple awkward hault because you have no idea what lies ahead of you. this is why 'widescreen' is important for a game like sonic. Really great game so far! It feels like the Genesis Sonic games but you can actually fight, not just awkwardly jump into enemies. This game is excellent. It takes the Sonic formula and gets rid of most of the gripes I have with the old Sonics. You can attack enemies properly, the level design has meaning and themes, and the bosses are hard but not unforgiving. I highly recommend it. The game looks good, I think this will be my next Wii U game here. @Aurumonado and yet I would much rather play Sonic 06 if given the choice. This game is also 15% off if you downloaded the preview earlier this year. Good deal. @WaveSpooky Well, the levels in the classic Sonic games were well designed enough that you were rarely punished for not being able to see far enough ahead during the speed sections, and then the levels would naturally slow you down to handle the trickier yet fair platforming sections. This game sounds like it does real justice to those ideas. Unfortunately, both the excellent level designs to properly handle Sonic's speed and the mix between high-speed thrills and well-designed slower platforming are unfortunately missing from more modern Sonic titles like Unleashed and Colors. @Spin I'll give you the first one (although using your jumping ability as your primary attack is hardly a deal breaker as Mario can attest), but I've always found the classic Sonic games to have excellent level design, and how many classic Sonic bosses are really that unforgiving? I'm hardly the most skilled platformer player, yet the only ones I really have a gripe with are the Wing Fortress boss in Sonic 2 and the final boss of Sonic 3 (when not locked on to Sonic & Knuckles, the only one I still haven't beaten to this day, except when facing it as Knuckles in the locked-on version), and perhaps somewhat the final boss of Sonic 2 just from how long and drawn out it is with no rings after just facing Silver Sonic. Admittedly, there are also a few that can cause cheap hits or deaths such as the Mystic Hill boss in Sonic 2, Metropolis boss in Sonic 2, Hydrocity Act 1 boss in Sonic 3, or the Death Egg Act 1 boss in Sonic & Knuckles, but they can usually still be handled within a few attempts. Was hoping for at least a 9 but an 8 is fair. It does have a few kinks here & there and some elements that are clearly gonna be down to personal opinion (Story, Voice Acting, some of the game mechanics). It doesn't detract that Galaxy Trail put in a lot of effort and clearly showed their sources of inspiration (Sonic, Gunstar Heroes, Rocket Knight, Megaman, etc). All in all, an immensely fun game and a great reminder of past gaming. I personally place it up there with the likes of Shovel Knight and my Late Under the Radar Game of 2015. What does surprise me is whilst minor, this game has been receiving a tidbit of flak purely for being inspired by the Sonic Mega Drive titles. Seriously what's wrong with that? Also as you go further into the game the differences begin to become more profound; plus being inspired by past titles is hardly a bad thing; especially if it's games that many people still hold in high regard. Been playing this on Steam off and on for a year now and its still better than the 16-bit Sonic titles IMO (beat the 1-3&K about 3-4 times a piece with around 30-40 hours into S3&K alone in 1995) and this is what I always thought a proper Sonic game should have been and looked like on the Sega Saturn in 1995/1996. The system would have done far better in the west if it had a game like this at launch and without the $400 price tag and surprise launch. Wish it was on 3DS. I was more speaking of bosses being hard as well as forgiving. Classic Sonic bosses were always easy with the exception of the final boss. You could easily bounce on eggmans head a few times consecutively if you were good. Freedom Planet's bosses had a few patterns that required the use of a different attack. The bosses almost felt Megaman-ish in their design. 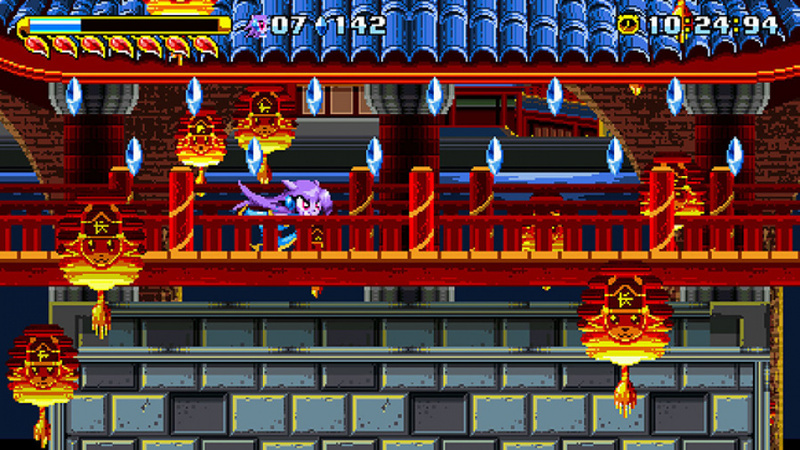 As for level design, each freedom planet level uses a different theme. One level requires you to find keys and use them on a lock, another level has you traverse it without oxygen, forcing you to hold tight to your bubble shields and not take damage (without the hassle of the pesky water physics). Another level has you go to a couple places in any order you like and then meet back at the start point to fight the boss. I'm not saying original Sonic's weren't fun, but this game extends the Sonic formula's potential while ironing out the bad parts of classic Sonic. @Artwark I think the mechanics for each set of moves are interesting and work well within each specific character. However, there are certain situations where it felt like Lilac far and away had the best tools for the job. I agree with you about collectibles being on the low end though – for me that's not an issue, but I could see some people wanting more in that area. @Dr_Corndog In general, people may disagree (seeing as how the first few Sonic games were well received), but classic Sonic games just never did it for me. I felt like they were lacking in most of the areas I mention – pacing of gameplay, story, level design – and no matter how much I tried, I couldn't get into them. 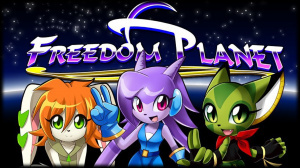 I loved Freedom Planet though! @FX102A I hear you! I would have scored it an 8.5 if I had a 20-point scale to work with, but I ended up rounding down. Might double dip when a portable version comes out, otherwise relatively uninterested into a retro sidescroller on my WiiU. Still on my watchlist though. @Spin Oh, you were saying the "Freedom Planet" bosses are "hard without being unforgiving," so the classic Sonic bosses are too easy? Like I said, there are plenty of difficult ones as well. In addition to the ones I previously mentioned, there are also other tricky ones like Springyard, Casino Night, Marble Garden Act 2, Launch Base Act 2, Sandopolis Act 2, Lava Reef Act 2, Sky Sanctuary, and of course Doomsday. Also keep in mind that any time you go for extra hits involves the risk of taking damage if you try for too many. The only ones that are total cakewalks are Emerald Hill, Sandopolis Act 1 (once you figure out the trick to beating it, probably the most creative boss in these games), and fighting Kunckles in Hidden Palace. Oh, so by "different themes" you mean different systems of hazards and/or beating the level. That only works if each one is solid, otherwise you get a mixed bag of quality like "Earthworm Jim 2." There's certainly nothing wrong or "bad" with keeping a standard gameplay formula throughout an entire platform game [and even classic Sonic mixed it up sometimes with the Sky Chase, Sandopolis Act 2 (which was NOT very fun in that specific case), Sky Sanctuary, and Death Egg Zones, and of course Doomsday Act 2 if you had all the Chaos Emeralds]. There may be more variety in the different levels of "Freedom Planet," but that doesn't necessarily mean that the quality is any better. I'll have to see for myself before I judge them, though. @BulbasaurusRex Well I do recommend it. As I said it does improve upon the Sonic formula well. So if you like Sonic it's likely you'll enjoy the game. This game is actually a real clone of sonic, as you can see it's engine - https://info.sonicretro.org/Sonic_Worlds. It's stupid to call this better than sonic, especially if you havent taken into account his great 2.5 games. That game just pulls strings by using an engine that's free and used to make fangames that look outdated for the nostalgia factor of when you people think sonic was 'good' The modern era sonic is better than that era you are stuck in. I strongly disagree on the Sonic bosses. The ones you mentioned are pretty easy. I mean, I was able to beat Sonic 2, 3 and Knuckles with the only one being challenging being Sonic 2...when I was 9! The final one without rings in Sonic 2 is really the only one I find difficult. Sure, some of them are not cake walks, but an overwhelming majority is pretty easy. @Ultrastratospher Well... I mean, you're wrong, but you're entitled to your crazy opinion. Genesis era Sonic is best and if this game pays homage to it then all power to it. If you own a Wii U, you simply MUST get this! I think it's the best retro platformer to have come out of late. Even better than Shovel Knight, and I love Shovel Knight. I know this was out on other systems before, so I never really got to play it. Now, it might be one of the best games I've ever played! Seriously, it is easily a 10 out of 10, at least 9, this review is really underappreciating the game! I think this game is better than most Sonic games. It is easily up on the level of Sonic 3 & Knuckles and Sonic 2. It could even be better, depending on mood and opinion. You won't regret getting this though. It really isn't just another "retro platformer" but rather a unique retro platformer. Easily one of the best games I've ever played! 8 is a harsh score, this a wonderful game - fantastic colourful 16 bit inspired visuals, characters have loads of charm, stages are interesting, bosses (for me) are perfectly balanced for difficulty, nice little story and controls are good (whilst not quite as tight as sonic). I love retro-inspired games so I'm a little biased but for me this is a 9/10. @holygeez03 Well, I guess it's time to get this game now. It's on sale. Never heard of it. Got it in the humble bundle and I'm amazed. What a great game. Smiling from ear to ear here. Pure fun. I plan to play this now that it's in a humble bundle. I really like the idea of a story mode and a mode with pure gameplay. I'll undoubtedly play through the story mode the first time I play this, but if I want to replay it, I can just select a different mode and play the stages without having to worry about hammering the start button to skip past the talking. @Ralizah Just got the Humble Bundle, and it looks like its going to be fun. I haven't had time to play it, because of school and Street Fighter IV though. First 2D 'sonic' game I played and been enjoying it. I never played a 2D Sonic game before because it seemed boring, so I didn't knew what to expect of this. Glad it turned out alright. Might play Sonic 3, S&K and CD in a future.